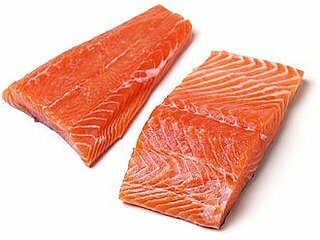 Use fresh, thick salmon filets. You’ll need 8 (10 inch) skewers; soak wooden skewers in water before cooking. Also, fresh parsley makes all the difference in flavor for this dish. In a small bowl, combine 4 Tbsp (1/4 Cup) oil, vinegar, garlic, 1/4 tsp salt, 1/4 tsp pepper in a bowl, mix and set aside. Heat the grill to high (425-550 degrees). In a large bowl, combine the remaining oil with the remaining pepper, toss in the salmon and coat all sides. Set out rows of 3 salmon chunks on a clean work surface. Wrap the turkey bacon around the salmon weaving long pieces between chunks. Skewer each row of salmon leaving a little separation between pieces. Oil the grill grates using a wad of paper towels and tongs. Set the kebobs on the grate, grill covered, turn once, until fish is barely cooked through about 5 minutes. Stir the fresh parsley into the bowl with the oil and vinegar and drizzle on top of the kebobs. This entry was posted in Entrees, Metabolic Medical Center Recipes, Modified Profast (Fast and Flexible) Recipes, Nutriplus Recipes (Balance Your Pyramid), Party & Entertaining, Seafood and tagged grill, herbs, metabolic recipes, olive oil, parsley, salmon, vinaigrette by foodies4mmc. Bookmark the permalink.